I have recently seen some heated discussion over the subject so I figured instead of derailing other threads we can discuss it here. In each scenario Doom and Thor have one week of preparation. Round one: Doom vs Regular Thor. Round two: Doom vs Odin force Thor. Round three: Doom vs Rune Thor. Neither can ask for outside help, they can however manipulate others. They can only use items that they have shown the ability to obtain for themselves. How would this go down? @CapitolPunishment: In one week of pure prep I think Doom could manipulate the FF into help make something to stop Thor. I can't recall Thor doing anything with prep and he has no interest in manipulating others. With a week of prep, Doom will have a device of ultimate power and half of Marvel ready to take down Thor. Thor stomps unless Doom has prep. Did Thor fight Dr. Doom somewhat recently? Like say a year or two ago? I remember I saw a comic book cover that showed that Thor was going to fight Doom but I never got my hands on it. If anybody knows what I'm talking about and has scans of the fight it would be appreciated. Anyways, Thor would win if Doom didn't have prep. But Doom does have prep and he should take this. @Fetts: I think you are talking about Latverian Prometheus, here both Doom and Thor have one week of prep in each battle. @venomoushatred1001: They both have a week of prep in all three rounds. 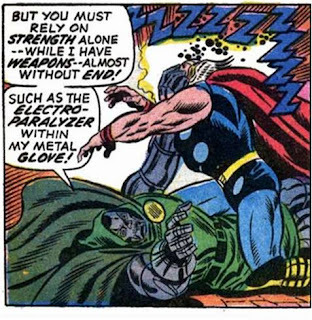 Thor doesn't hold a ghost of a chance against Dr. Doom's magic. Dr.Doom has already beaten Thor before, but it was with prep though. But I agree with you, If Doom has no prep, he loses, BADLY. In which issue, Do you have scans? What let to Doom do that? Was it with Loki's help? Round one: Doom vs Regular Thor. Doom just might take the win by making better use of his prep time. I can see Thor winning as well but I think Doom is more likely to cook something up to get the victory. Round two: Doom vs Odin force Thor. Doom's in big trouble and is probably gonna lose this one. Round three: Doom vs Rune Thor. Yes. Thor has already beaten Doom with prep. @CapitolPunishment: Actually that debate wasn't about Dr doom vs Thor..Someone said Thor can do anything Doom can with prep .. If Thor wins it would be because of his powers not that he is better then Dr doom when it comes to prep.. If Dr doom wins it would because of Prep..
Sir if doom has one week prep. thor would have no chance. Doom would probably beat regular Thor. Odin Force Thor, I doubt would lose. And Doom would have no chance against RKT. Doom will destroy Loki in the arts of magic. One of Dr. Doom's photon shots can nullify Thor. If you want to use Rune King Thor, might as well use Beyonder Doom. Dare I bring up Thor Annual '99? Read the last panel. See who's foot that is on top of Thor. That's a Doombot's foot. Doombot's have no magic and Thor was blasted once with a beam that was "more powerful" than Cosmic Spiderman's Uniblast. Furthermore. Thor fought the real Doom. And Doom once again, reverted Thor into Donald Blake. 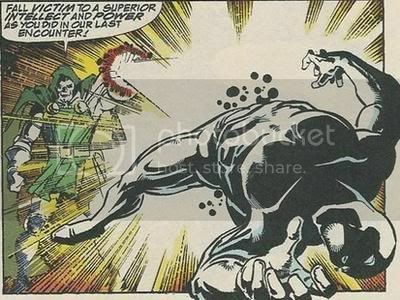 But of course this is no surprise if Doom can do the same to Silver Surfer. You misunderstand. Dr. Doom is second in magic to Dr. 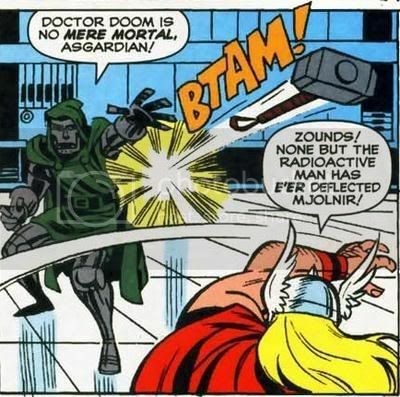 Strange so if you say that Mjolnir is more powerful than Doom, you are accepting that Dr. Strange is inferior to Thor too. But that's not true considering that the magical power of Dr. Strange/Dr.Doom possess is greater than Mjolnir. Ask yourself if Odin or Mjolnir is stronger than the powers of an individual Extradimensional Deities. Now combined each of the Extradimensional Deities. 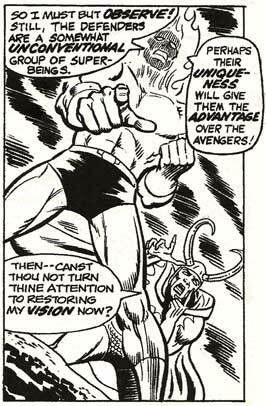 Odin's power at maximum potential couldn't even lay a finger against one Extradimensional Deity. Heck, Odin is no match for Gaea and Gaea is leagues below the status of the Vishanti. But what really makes this argument eye tearing is the fact that some people think that Loki's power equals in terms to Odin's. Dr. Doom can summon the power of Trinity of the Ashes. And what if Doom summon's the power of Cyttorak? 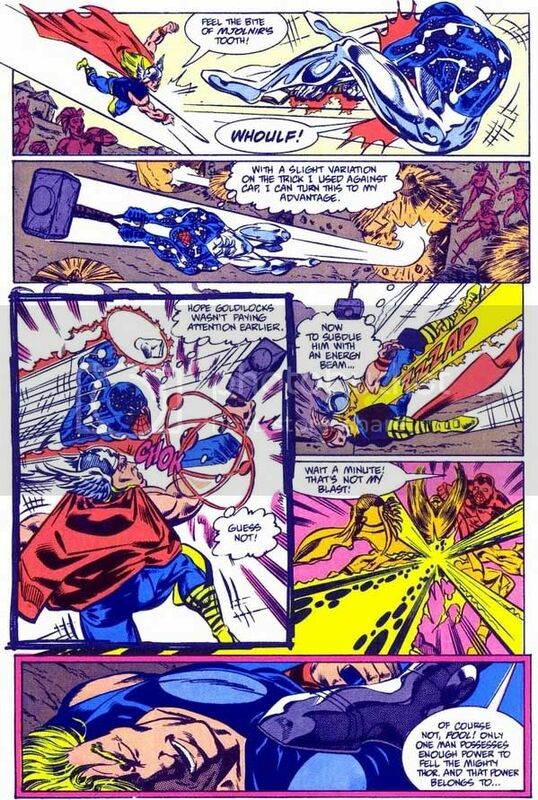 Doom with his technology alone is enough to par himself with a full power Thor. In fact, with that power and his will and wits even without the magical invokes places him far above Thor. Placing Doom's magical aid will place him so far past Thor, it would be a joke. NOTE: Doom's character cherishes technology more because it allows him free will to choose his own destiny. It is rare that Doom invokes magical powers because he does not like praying to higher entities to grant him power. 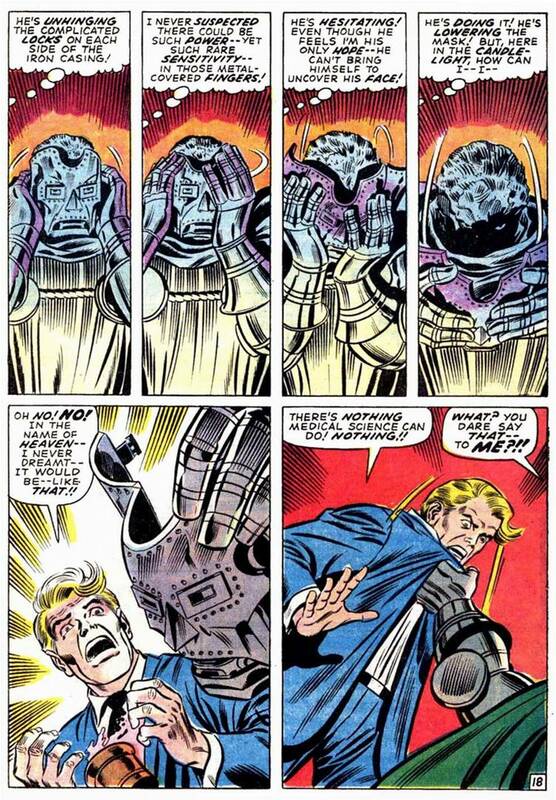 However, Doom has invoked before, and if Thor decided to find all Runes to over power Dr. Doom, what is it to stop Dr. Doom from invoking more powers from his own set of Principalities? What is it to stop Dr. Doom from siphoning the powers of Galactus or Beyonder if granted allowing Thor to become Rune King? So either way, Dr. Doom wins this and the only way Dr. Doom looses is if the OP handicapped Dr. Doom or turn CIS ON against Doom. Even Thanos of Titan is worrisome of Doom. Yessss. Depending on what plot devices Doom has at the time, he can take round one. If he fights Thor like he did previously pretending to pull an Iron Man by building himself a homemade destroyer, he gets destroyed again. Thor should win the latter two without any effort if he uses half a brain, hard to out prep someone with omniscience. If he just goes to fight him via armor, he gets owned quick. Along with any Doombot(given that was what Doom had Thor fry to jump start his suit). Edit: @MarvelRulesTheWorld: Dear god, holy out of context scans Batman! @Ancient_Spirits_of_Evil: Because Doom's one of the few folks in Marvel that has come into possession of select plot devices to rob folks of their power, albeit if his own arrogance led to his downfall or select beings taking their power back. @isaac_clarke: LOL at you saying about Doom's plot devices when Thor is a walking one. Oh that is true, don't get me wrong. Most characters in Thor's caliber tend to fit that bill. In Thor's case its usually that divine heritage or enchanted hammer that lets him overcome hurdles of all shapes and sizes. But that doesn't change that Doom has more than his fair share of plot tech and people in the same intellectual ballpark can create items out of the blue to save the day or accomplish ridiculous goals. Or in Doom's case even gather a horde of plot devices and jack divinity from some random bloke. Dr. Doom doesn't have plot devices, because he is usually the antagonist with the bad luck (CIS) against plot induced characters such as the Fantastic Four. As comic rule, the Protagonist are the PIS while Antagonist are the CIS. If anything, when people like Thor defeat Dr. Doom; it's through PIS and Doom's bad luck. So it's up to whose plot device is stronger. I say a draw. Doom. Crimson Bands of Cyttorak FTW. At least people watched his movie. Round 3: Unless Doom uses the same kind of PIS he used on the Beyonder, Rune King Thor would stomp. Yeah, Doom first and second rounds. The third, whew, that's an ultra stomp in Thor's favor. Crimson Bands of Cyttorak. Nuff Said. Of course virtually anything is possible for the fantastic 4,but add one Dr.Doom to the equation and I think they could all cook up something to possibly beat Thor, "maybe"
What was the point of that scan? Dr Dooms prep is so ridiculously over wanked that it isn't even funny.. His prep is conditional, and there has to be a certain circumstance in which something is in his favor to manipulate. He can't just sit down and decide he wants to steal someones power or take over the universe, there has to be a circumstance which won't always be an option. If that was the case then Dr. Doom would have been god a long long time ago..